Danish Army Specific: Used as workshop-van. 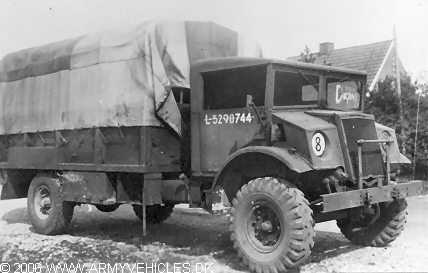 Historical: More than 200.000 of this type of truck (3 ton, 4 x 4) was build in Canada during WW II by Chevrolet and Ford, similar in design but differing in details as engine, drive line and axles. Length: 6.15 m (240 inches). Width: 2.22 m (86 inches). Height: 3.04 m (118 inches). Weight: 7.800 kg (17.160 lb.). Engine: Own V8-cylinder, 3.917 ccm3 (239 cubic inches) displacement, carburetor, liquid cooled. Horsepower: 95 at 3.000 rpm. Electrical system: 6 volt, positive ground. Fuel capacity: 2 x 56 liter (2 x 12 gallons).